NOTE: This page contains much higher graphic content than normal for commentary pages. It may be slow to load on non-broadband connections and is best viewed on a large-screen desktop computer. While Fr Eugene Stockton's recently published book, This Tortuous Ridge, will primarily be of interest to residents and those interested in the local history of the Blue Mountains in New South Wales, we have something from that book that might be of interest to a wider audience today. Eugene is also an archaeologist and has had a lifetime interest in the indigenous history of Australia before the arrival of the Europeans in 1788. A significant part of his research, which has been all over the world, has been centred here in the Blue Mountains where he was born. He was surprised to learn in his research that this central part of the Blue Mountains where we live was actually spiritually significant for the original indigenous inhabitants a long, long time before Europeans discovered the land. In this chapter from This Tortuous Ridge, along with archaeologist colleague, Kelvin Knox, he shares some of the history of this Sacred Ground. Reconciliation calls for a change of heart and mind. It will come about in Australia when we see ourselves as one people, on one land, with one long history. By far the vast majority of Australians who have ever lived have been Aboriginal people. It makes sense to see them as the core of our nation going back some 60,000 years, with recent accretions of successive waves of migrants from across the seas. The pre-history of this land is the pre-history of a nation. As for Australian prehistory at large, so the pre-history of the Blue Mountains is part of our continuing history. The original inhabitants of the Blue Mountains, stretching back tens of thousands of years, are our spiritual forebears, providing a rich cultural and material heritage to residents today. Archaeologists, venturing out into the local bushland, are seeking out signs of these forebears of ours. Once an archaeologist, handling a stone artefact just brought to the surface, wondered at the last hand that had held it: "like a handshake across the centuries". 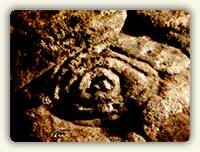 The rock art he or she examines is a legacy of signs for the people of today. Cave paintings and rock engravings depict the spiritual beliefs and practices of a people long ago, but they still speak to us of their reverence for the land. The Central Blue Mountains, with its three spurs (Lawson, Linden and Woodford Ridges) running north and south off the main ridge, is particularly rich in Aboriginal art, eloquent testimony of sacred regard for this mountain terrain. The earliest known amateur archaeologist to delve into our prehistory was by a Mr. Bourne, who excavated the Aboriginal Wells at Gloria Park, Hazelbrook, in the 1920s and recovered a couple of "spearheads". 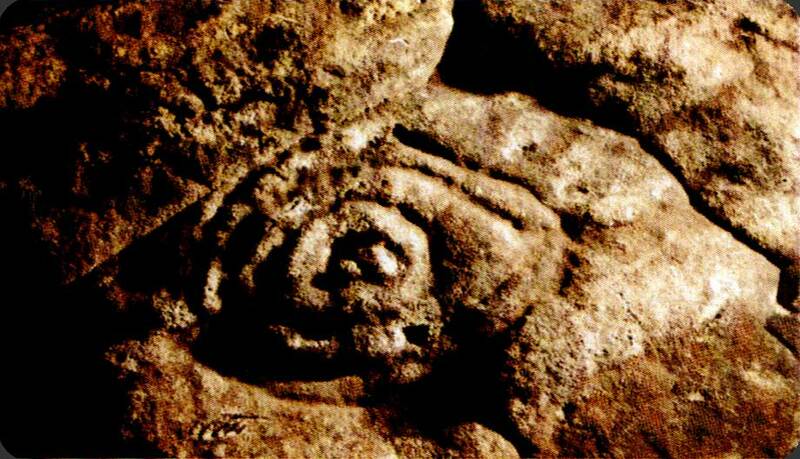 The accompanying axe-grinding grooves, possible engraving of a fish and the nearby rock shelter, housing more stone artefacts, confirmed Aboriginal use of the complex. In 1940, C.C. Towle, who had earlier recorded the Red Hands Cave at Glenbrook, reported the Concentric Circles engraving on the Woodford Ridge. 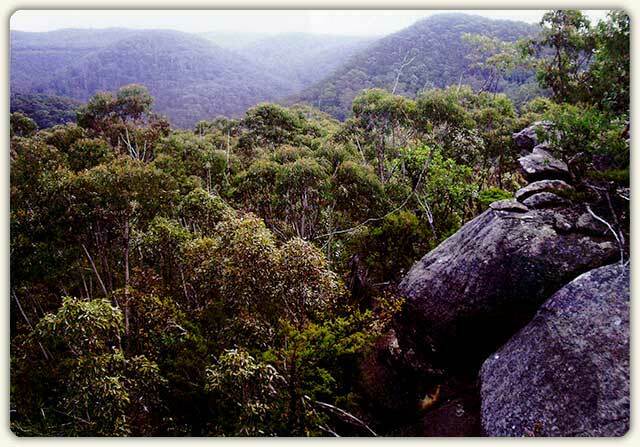 This ridge used to boast a bora ground stone arrangement; but still has rock engravings and axe-grinding grooves. 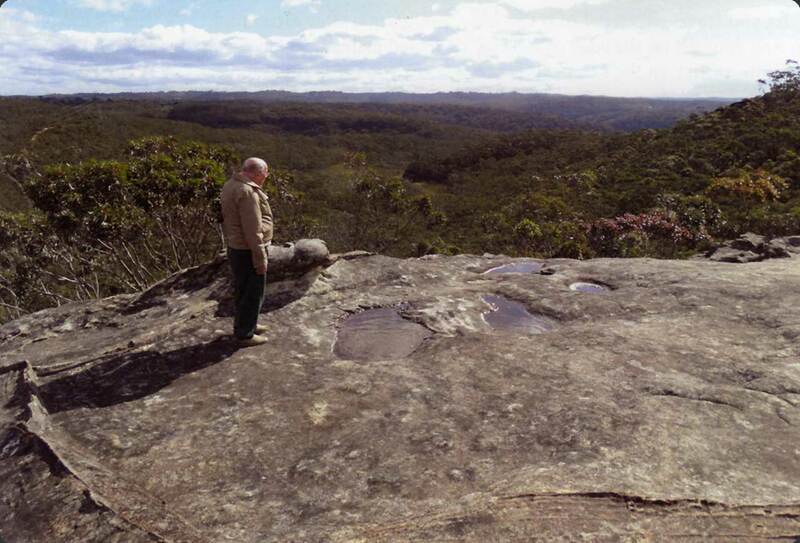 In the 1940s, Fred McCarthy, one of our earliest professional archaeologists, recorded a number of rock engravings in our area, including the kangaroo at Lawson and emus at Faulconbridge. The Daily Telegraph on 16 September 1958 carried a two-page story of how a local identity, Joe Stratton, took McCarthy to a Linden rock shelter featuring charcoal drawings of humans and animals. 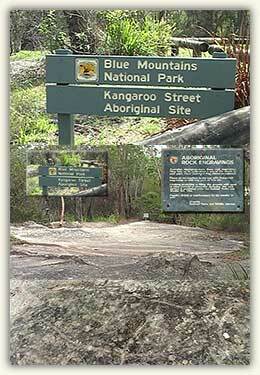 From 1970 more systematic exploration of Aboriginal sites took place. NSW National Parks rangers, John Gallard and John Buhr, were recording sites in the area between Glenbrook Creek and Bedford Creek, including important cave paintings leading up to Woodford Ridge. Eugene Stockton began a campaign of surveys and excavations in the Blue Mountains. 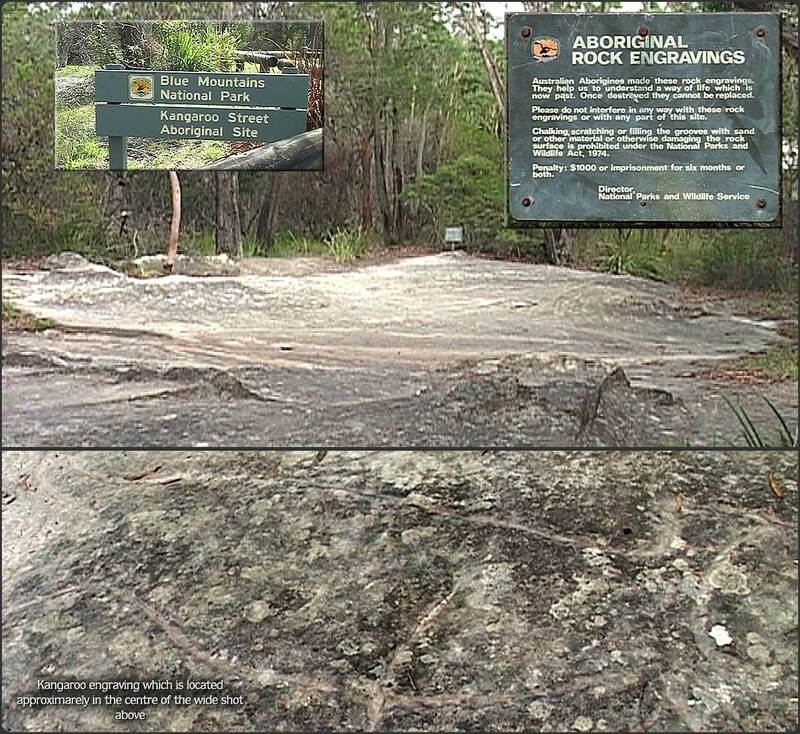 Surveys along the Lawson and Winmalee Ridges showed remarkable contrast between the two areas. The Lower Blue Mountains (likewise, as appeared later, in the Upper Blue Mountains) revealed numerous major occupation sites. By contrast, the Central Blue Mountains showed a concentration of rock art, and its occupation sites, though just as numerous, were only slightly occupied — as if people visited them for specific purposes for shorter durations. The contrast, as hypothesised, was between the domestic activity in the former and the spiritual activity in the latter. Excavation revealed a high antiquity of human presence: up to 50,000 years ago along the Nepean and 22,000 years at Kings Tableland. Several campsites were shown to have been used only during the very arid period of the Last Glacial Maximum (peaking at about 18,000 years ago). They included Horseshoe Falls at Hazelbrook. In 2003 Matthew Kelleher gained his doctorate, after supporting field work on the subject of sacred space in the Blue Mountains. He demonstrated scientifically that there was a certain gradation of sacredness in rock art: from charcoal drawings to paintings, hand stencils, figurative engravings, and finally to track engravings. This indicated that people were travelling along certain routes probably on a sacred journey culminating in special liminal locations. Typically, these locations were broad ridge-top rock platforms, usually vantage points with awe-inspiring views. They were often associated with rock engravings, a rock pool basin (probably artificial) and clusters of axe-grinding grooves. 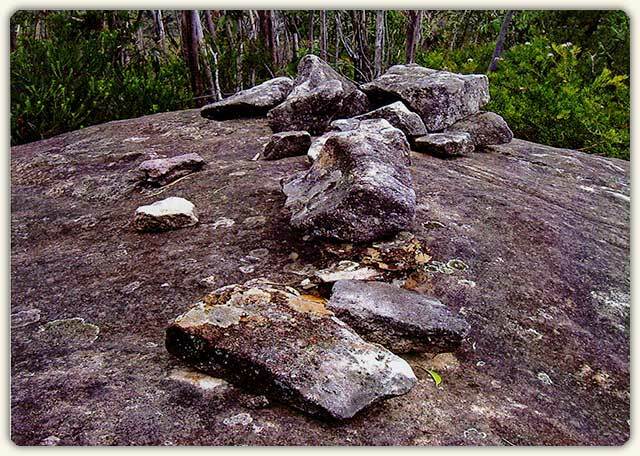 Such locations were found on each of the north-south spurs of the central Blue Mountains and undoubtedly were venues for ritual and ceremony. Comparable sites may have been located on the main east-west ridge, but they would have been lost to the construction of road and railway, and to township buildings along the top of the ridge. In 2010 a group of local people (archaeologists, anthropologists, others) formed a forum "to promote, for the benefit of Aboriginal peoples and wider society, the research and preservation of Aboriginal cultural heritage of the Blue Mountains and surrounding areas". Members of the forum agreed to follow up previous surveys in the region and to extend them systematically. 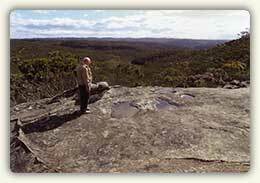 Michael Jackson and Sharyn Halls have concentrated their research in the Kings Tableland Ridge west of Bedford Creek and sloping south to Warragamba Dam, and Bruce Cameron has consolidated many years of exploration in the Blue Labyrinth in the east draining into the Nepean River. Between these two areas Kelvin Knox has facilitated numerous searches in the Central Blue Mountains, convinced that despite considerable finds of the past, many more sites remain to be located. The record to date can be tabulated as follows. Typical Blue Labyrinth country where Aboriginal people once lived, south of the Woodford Ridge. Republished on Catholica with permission. Father Eugene Stockton has served as a parish priest and priest assistant to the Aboriginal Catholic Ministry (Parramatta Diocese). He has gained doctorates in theology and philosophy (Sydney) and a licentiate in sacred scripture (Rome). Lecturing for many years in the Catholic seminaries at Springwood and Manly, he has written widely on theology, spirituality, scripture, archaeology, anthropology and social issues. Kelvin Knox is an archaeologist resident in the Blue Mountains. E. Stockton, "Aboriginal Wells" (in E. Stockton & J. Merriman eds.) Blue Mountains Dreaming: The Aboriginal Heritage (2nd Ed.). Blue Mountain Education and Research Trust, Lawson 2009, p.22. C.C. Towle, "Rock Carving near Woodford, N.S.W". Mankind Vol.2, No. 8 1940, p.288. F.D. McCarthy, "Records of the rock engravings of the Sydney District", Mankind Vol.3, No.8 1946, pp.217-225. E. Stockton, "Archaeology of the Blue Mountains", Blue Mountains Dreaming 2009, pp.41-72. M. Kelleher, "Aboriginal Art in the Blue Mountains", Blue Mountains Dreaming 2009, pp.73-102. K. Knox (ed), "Terms of Reference for the Greater Blue Mountains Aboriginal Archaeology Forum", August 2010. Over a hundred art sites have been recorded in this area. B. Cameron, A History of the Blue Labyrinth: Blue Mountains National Park. (2nd Ed.) 2014. "Woodford Ridge" here refers to the part which runs north to south, before it turns eastward, while "Blue Labyrinth" is restricted to the maze of creeks and spurs running east of Woodford Ridge to the Nepean River. 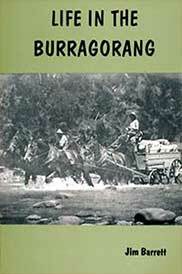 What makes Burragorang so special? It is not so much an emotive response to the fact that a scenically beautiful valley had to be drowned in order to satisfy a city's need for water. Beautiful it was before, and beautiful it is now, but in my mind the reason for its 'special-ness' is more philosophical . . . The circumstances under which the Valley was settled are twofold: the controversial issues of convict emancipation in Australia, and the attempts to breach the western barrier which constrained the development of the young colony.